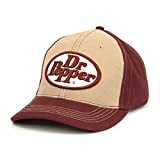 Dr Pepper is a popular soft drink made with 23 flavors to a secret recipe, the oldest major brand in the U.S. Contains 150 calories per 12oz can. 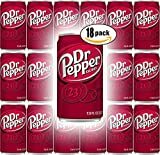 Dr Pepper has expanded their drink range with flavor variations and diet versions of their sodas. Carbonated water, high-fructose corn syrup and/or sugar (40g), caramel coloring, phosphoric acid, artificial and natural flavors, sodium benzoate (preservative - 55mg), caffeine. 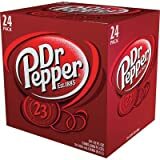 Dr Pepper contains 3.42 mgs of caffeine per fluid ounce (11.55mg/100 ml).